I no longer work due to the rather severe autoimmune disease I have now, so don’t have to worry about looking suitably professional when I ride my bike around town. However, last week I was asked to do some consultancy work for one of my former employers and I really had to look professional when I did this work. Now, it is one thing to wear a skirt and tights and another to really dress up for professional work. There are plenty of women bike bloggers who ride to work in their work clothes and who work in ultra professional occupations, so this is obviously possible. Formerly, when I rode to work, if I had a long ride (around an hour) I would carry a change of clothes in a backpack and have a sponge down and change of clothes when I got to work, or if I had a shorter commute (say 25 minutes), I wore my work clothes on the bike. Both these systems worked fine. But what if it is raining, you are not a regular worked in the office you are visiting and you arrive all wet or sweaty, even though you might have quite adequate rain gear or a change of clothes. It is not really going to be possible to shower and/or change clothes when you are a stranger or newcomer to that office. 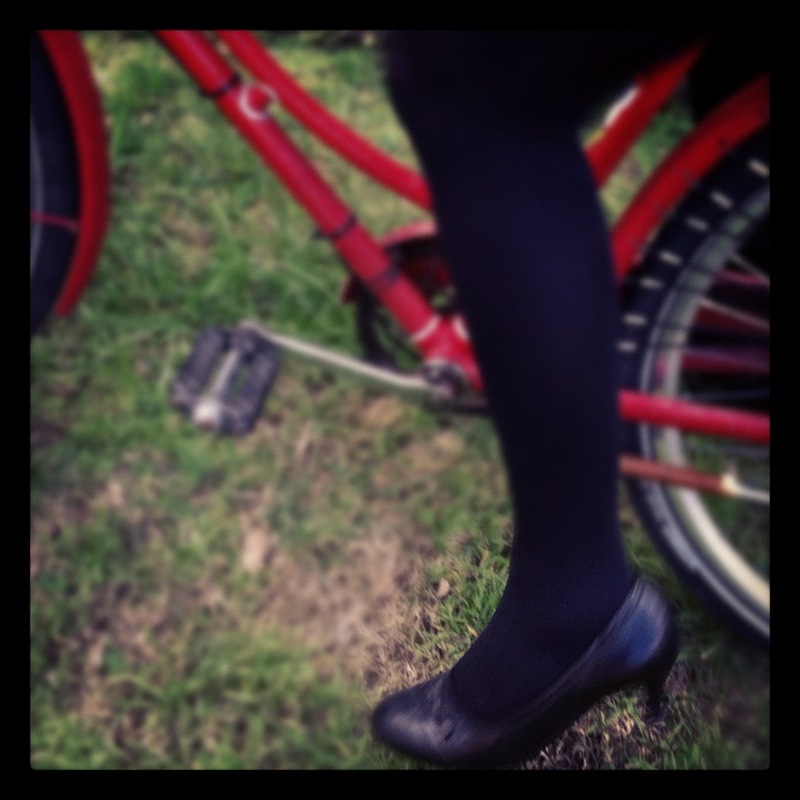 My bike allows me to easily mount and dismount in a skirt and still look professional and reasonably elegant. That is an added advantage that many bikes do not have. But it is still difficult in some circumstances to maintain a high level of professional dress when on a bike. I ultimately rode to one meeting and drove to the other two as it was cold, dark and wet on those occasions, and I don’t think that anyone was aware of my mode of transport for any of those meetings. This entry was posted in Uncategorized and tagged about me, cycle clothing, speedwell, women on bikes. Bookmark the permalink.